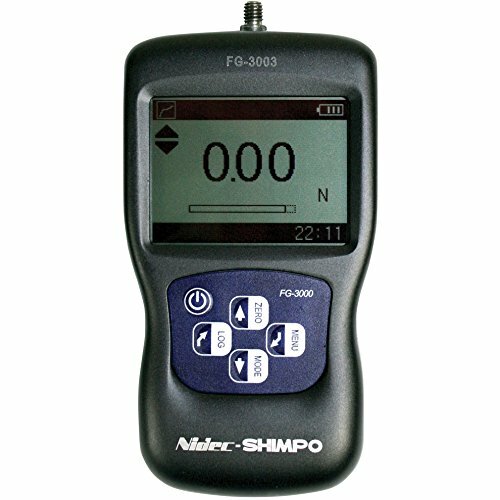 The new FG-3000 Series digital force gauges are the choice for simple, cost-effective tension and compression testing. Combining one of the most compact housings, yet maintaining a large back- lit LCD, these units were designed to fit perfectly in the hand for ease of use. The multi-language FG-3000’s provide menu programming for intuitive set-up of the instrument to your desired requirements. Three modes of operation are selectable: Track mode displays live readings, Peak mode records the maximum reading sensed during the test, and Pre-set mode which activates user defined high and low limit set points. The programmable limits provide a quick visual and audible indication if a test passes or fails. In addition, a comparator output enables integration of the instrument into your quality system for repetitive testing such as on production lines. The display graphics facilitate user comprehension and operation. An analog bar graph provides perspective of current reading in comparison to the full scale range. Pass/Fai l icons provide an instant response of the testing outcome while a storage symbol acknowledges when a reading is logged. A menu-selectable display orientation streamlines switching from push to pull testing for portable or test stand applications. These high- tech instruments can log up to 500 readings at the push of a button for instant data acquisition. The data can be viewed on screen, sent to optional printer, or uploaded on the free software program for graphing and statistical analysis. Models are avail-able from 2.2 to 220 lb ranges providing a large offering for various applications such as, incoming quality inspect ion, finished goods testing, R and D or almost any portable or force stand testing requirement. View More In Motion, Speed & Force. If you have any questions about this product by Shimpo, contact us by completing and submitting the form below. If you are looking for a specif part number, please include it with your message.